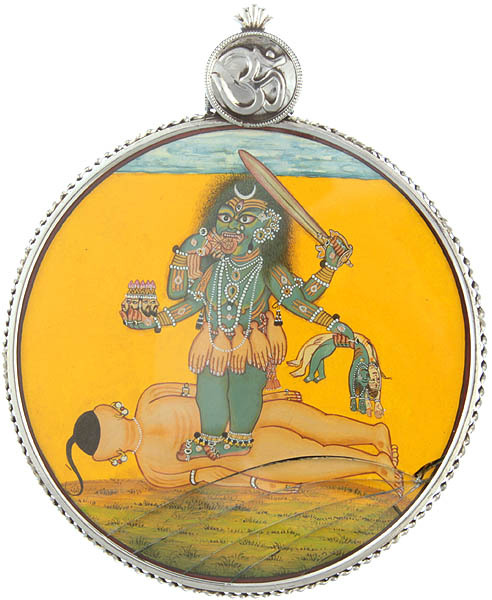 Contained in a small, circular pendant, this image of the Devi Bhadrakali is as awe-inspiring and ferocious as they get. 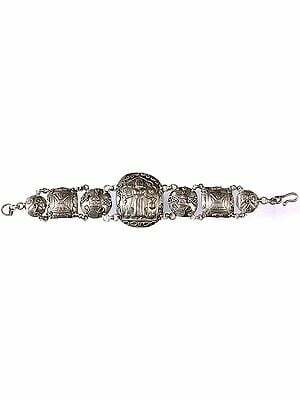 Portrayed on sterling silver, the iconography is stunningly replete. She is dark-complexioned and long-limbed. Her tresses fall in wild curls about Her shoulders, and a sliver of the silver moon rests on Her brow. Her pearls-and-jewels shringar is what practically clothes her besides the girdle of severed human arms around Her loins. In Her four arms (ashtabhuja) are the remains of vanquished adharmees and the sword She has weilded against them. The aspect of her that truly conveys Her power as Devi are Her large, bloodshot eyes, and their fierce, determined gaze. Devi Bhadrakali stands on the prostrate form of a man on the grass. Except for the hints of adornment on His arms, neck, and lobes, He is naked. The dominant colour of the background is the rich golden yellow of the tropical sunset. A layer of thick, pale blue clouds have been painted along the arc at the centre of which is an embossed aum syllable in smooth silver. The foreground comprises of the glowing green grass on which the ensemble stands, superimposed with a jet of water. The pristine silver of the foundation rims the composition. This statement pendant would inspire whoever sets eyes on it with an eerie curiosity about Devi Bhadrakali.